This is what I tell all my student teachers: teaching is the most rewarding profession there is, if you truly love it. Don’t do it for the money or July and August or because you don’t know what else to do; if you don’t enjoy teaching there is very little which will adequately compensate your efforts. Remember that this is a job you can do 24 hours a day, seven days a week, 52 weeks a year and still not get every task done, reach every child in the class or please every parent or administrator. If you allow yourself to be swallowed by the classroom you will shorten your career as a teacher. Illnesses will plague you and your students will eventually irritate rather than delight you. absorb and distract you when you are not teaching. These are the things that will renew you and make you a better teacher in the long run. Plan to arrive and leave at the same time every day. Creating habits for things that can be routine is a way of freeing yourself to spend your time and creativity on the more demanding work. Plan to eat lunch in the staffroom; eating lunch at your desk is counter-productive. You need to know your colleagues and become part of the team. You don’t do that eating lunch in your room. By the way, in most schools, it is poor etiquette to bring a parent into a staffroom. The staffroom is the one private place teachers can relax and be themselves. If they need to let off steam, let slip a couple of colourful expletives or lie down on the floor to soothe a sore back, this is their room. Visit other classrooms. 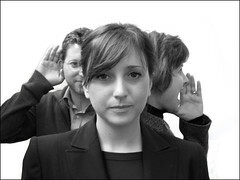 Chat with your colleagues, but be careful not to take up too much of their time. Keep abreast of school news. Teachers can’t afford to go into their classrooms and shut the door. There are lots of excellent books out there on how to organise your classroom and your time. What is important is to use a plan that works for you, no matter who recommends what, and create habits that allow you the freedom to put your mind to real problems. You should be aware that a great deal of paper crosses a teacher’s desk and your sanity depends on you being able to triage. Ideally get your desk cleared daily into appropriate files. 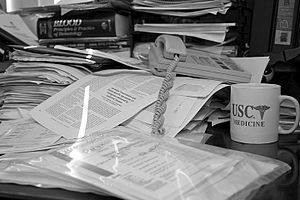 English: Paperwork (Photo credit: Wikipedia) A messy desk is counter productive – I learned that from bitter experience! Create a system and stick to it. Daily. the kinds of information and social announcements that are difficult to classify. One file was labelled Board Bumf and the other was labelled School Bumf. I put the papers in them in chronological order. This was easy as it just meant putting the latest one at the front of the file. Before I filed these papers, I noted anything I needed to know such as dates of events in my calendar; I learned to note all dates that had anything to do with the school even if they concerned another section. However, if I forgot to note important information, it was all easily accessible. I often forgot that we were supposed to bring certain papers to staff meetings; having a Bumf file meant that they were easy to locate. At the end of June, I emptied the files into the recycle bin without needing to sort them. 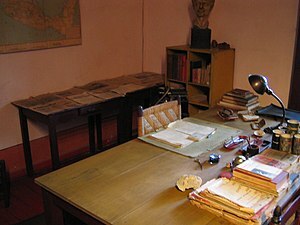 The desk (Photo credit: Wikipedia) some teachers desks are almost always this tidy. It takes careful planning, organisation and at least two mini-tidies a day. It also requires training students not to dump anything on your desk. behaviour, learning progress or questions concerning each student is invaluable. I always had several copies. I dated one when I started using it and dated it again when I filed it because it was full and I had to get another one out. These were extremely useful when I was writing report cards or assessing how a student was progressing. I also used them to leave notes for occasional teachers. If organisation is a major problem for you I suggest you take a look at the Fly Lady site. 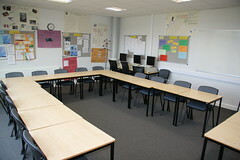 It includes a system for helping teachers get organised and stay organised as well as a system for organising the home. I have used some of her tips with students. One of the best is the fifteen minutes work period. For specific systems for classrooms, browse the shelves in education libraries; remember that you don’t have to implement everything at once. One thing that you want to try to implement is smooth transitions in your classroom. If your students go from one activity to the next quickly and with a minimum of fuss, time is saved for learning. That time adds up. It also means a calmer and happier classroom. It takes time, careful preparation and self-discipline to create these smooth transitions but it is worth the effort. the ugly. Too often poor behaviour is rewarded by our attention and we ignore good behaviour. 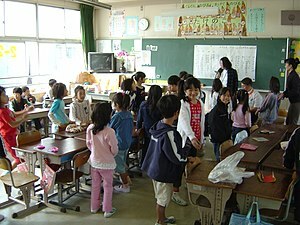 Casual chat with students before class starts often sets a mood or gives them the confidence to talk to you later when they have difficulties. Talk to the parents, too. Face to face is best but any form of communication is better than none. Keep your administrator up to date with life in your classroom. Principals especially appreciate storm warnings. Finally, when you find yourself unhappy or grumpy at school or at home, it is a sign that you are in need of a mental health day or two. Take them and do something you love. If they happen often, get help in identifying what is troubling you beyond fatigue or temporary stress. Remember, you can’t take care of anyone else if you don’t take care of yourself first.